The latest Powerball results are in, which brings with it—as with any other draw—both good and bad news. First, the bad news: no one won the $64 millions jackpot during last Saturday’s draw. Tough luck for those that were hoping to win big on the November 4 draw. Of course, even if you didn’t win the jackpot, you could still win any of the secondary prizes. The winning numbers were: 12-14-26-48-51, with a Powerball of 13. Now, as for the good news: as a result of last Saturday’s draw, come Wednesday, November 8, the Powerball jackpot will now be a whopping $75 million! The lone winner of the $191.1 million jackpot of the October 25 draw still hasn’t come forward. If have a Powerball ticket for the said draw date, you might want to double check your numbers. The ticket was purchased at Brownies Shop Rite store in Eunice, St. Landry Parish. Who knows, you might just be the mystery Powerball millionaire! Powerball isn’t the only one currently undergoing a rollover. No one matched all winning numbers during the latest Mega Millions draw last Friday, November 3—which means that this Tuesday, November 7, the jackpot will now rise to an estimated $59 million (from last week’s $48 million). As for secondary wins, two winners matched all five numbers, with one of them also winning with the Megaplier activated. Meanwhile, ten players won the third-tier, and some two hundred players won the fourth-tier. The last fiscal year, which ended June 30, wasn’t good for North Dakota lottery sales—especially compared to their performance during the 2016 fiscal year. From their record of $35.7 million, lottery sales plummeted by 22%, or by around $8 million. On the plus side, lottery activity during the latest fiscal was still recorded as the third highest in North Dakota’s history. Randy Miller, the state’s lottery director, also said that the figures might still change—if only by a bit—because auditing is still ongoing. One of the biggest reasons for North Dakota’s relatively unimpressive sales during the recently concluded fiscal year was smaller Powerball jackpots. Last year, the jackpot swelled up to a record $1.58 billion—which helped boost sales dramatically. A family man from Chicago recently became a lotto winner, and he has his kids to thank for it—sort of. Ramone Houston from Glenwood won in the October 14 draw of the Lucky Day Lotto by combining the birthdays of all his children. While most would scoff at this tactic, it worked out pretty well for Houston, who is now $400,000 richer. He plans on using his winnings to buy a house for his family. A Euromillions player from the UK recently came forward to claim his winnings for the November 3 draw. Hot on the heels of another big win the week prior, the UK man has now become the seventh UK player who has won big this year. The man, who has not yet decided if he wanted to stay anonymous or not, is the sole winner of the £25,476,778 jackpot. Woody Simmons, a U.S. Postal Service worker recently became a millionaire. On impulse, the Maryland resident purchased a Virginia Lottery scratch-off ticket last week—which paid off immensely! “I just screamed in my car!” – Woody Simmons, after learning of his big win. 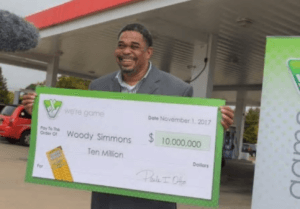 After scratching the card, Simmons found out that he had won a whopping $10 million in the Extreme Millions game. Simmons took the lump sum option—which means the prize is now $6.5 million before taxes. According to lottery officials, Simmons’ ticket isn’t the only $10 million ticket—there are three more out there. Who knows? You could be the next Extreme Millions millionaire! Your odds of winning the lottery is already quite slim, but winning twice in a single day is even more unlikely. However, the word “unlikely,” it seems, is not in the Kimberly Morris’ vocabulary. The North Carolina resident recently defied incredible odds. 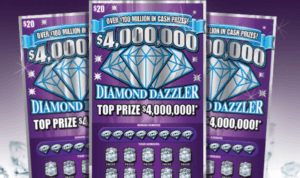 The improbable event kicked off when Morris, who plays the lottery mostly for fun, purchased a Diamond Dazzler scratch card last Monday and promptly won $10,000. Right after collecting her prize, Morris decided to buy yet another Diamond Dazzler scratch card. 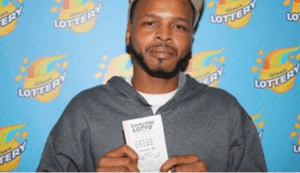 She wasn’t expecting much out of it, but lo and behold, the mother of three instantly became $1 million richer right then and there! According to statistician Ronald Wasserstein, the estimated odds of winning those amounts on the same day were 1 in 44,000,000. Heads up lottery players, the Pennsylvania state lottery is warning against a new type of lottery scam. The new scam utilizes various media; such as email or phone—and even social media. Using any of these means, scammers pose as lottery employees and attempt get unsuspecting players to divulge personal information. For instance, one of the new phone scams that targets Mega Millions players involves a scammer pretending to be a claim agent. He/she will often provide (fake) identifying information to erase any doubt a player may have regarding the caller’s legitimacy. Some scams also go the extra mile. Some, in fact, go as far as setting up a fake website or even a fake phone number to fool players. Whatever the case, always be on alert! If you were wondering how to avoid getting scammed, you might want to start here.